This is an odds-and-ends post, but all of the odds and ends deserve recognition. They are loosely linked by the theme of summer and strongly linked by a theme of deliciousness! First up: Chocolate peanut butter soft serve. Chocolate and peanut butter go well together, and chocolate and banana go well together, and peanut butter and banana go well together. Ergo, chocolate peanut butter frozen banana soft serve is pretty amazing. I made this with the PB Fit peanut butter powder I found last month, and added the chocolate component through dark chocolate chips and Choc Shot sugar-free chocolate syrup. I include a recipe at the end of this post, but if you throw frozen banana, peanut butter and chocolate together you can't really go wrong. Second: Thai-style spiralised noodles. Those of you who follow Healthy Vegan Fridays may have seen Mary Ellen's spiral Thai slaw salad last week. I've made lots of spiralised veggie dishes but not one quite like hers, and was immediately drawn to give it a try. I followed Mary Ellen's recipe almost exactly but added vermicelli noodles to make the dish sufficient for a stand-alone dinner. It was delicious and well received by Mr Bite and my mother too. I highly recommend it! Third: A Whole Foods picnic in Green Park. 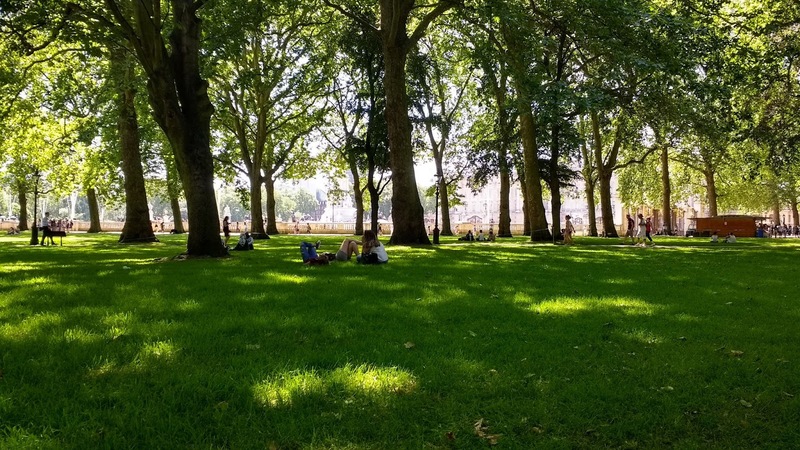 London can be rather unpleasant when hot, but its parks provide plenty of shady spots for escaping the heat. As I have a season rail ticket to London for my workday travel, I sometimes head in just to soak up the London atmosphere. Sitting under a tree with a Whole Foods lunch and a book is a particularly delightful way to spend an hour or two. 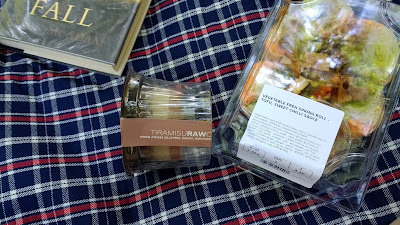 I bought one of my summer favourites - rice paper rolls with tofu and plenty of vegetables - as well as a raw tiramisu by the new-to-me brand Honey & Date. The dessert includes honey so is not fully vegan, although I was pleased to see that if you order products through the Honey & Date website they can customise them for you and use maple syrup instead. I enjoyed the tiramisu but it would have been a little better if eaten properly chilled (my fault for taking it to a park on a hot day). So there we have it - three very different examples of summertime eating, but all ones I'd be happy to repeat in a hurry. Combine the frozen banana, peanut butter powder and yoghurt in your food processor and process until the mixture is semi-smooth, scraping down the sides of the bowl occasionally. Add the chocolate chips and process briefly just to incorporate. Transfer to a serving bowl and drizzle with chocolate syrup to serve. What foods are you enjoying this week? Ooh what I wouldn't give for a warm day to lay out in the park! We are freezing our butts off over here. I don't mind the cold to be honest, but a day of lying out in the grass sounds pretty appealing right now. 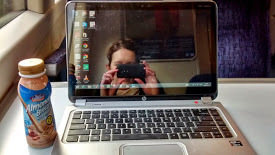 Public transport is particularly horrid! A lot of trains are air conditioned now, but unfortunately it's still hit and miss, so you can get caught out even if expecting a cool carriage. Like you say, though, it's not for many days of the year. Omg!! The soft serve peanut butter I've-cream looks amazing!!! The soft serve sounds super delicious. "if you throw frozen banana, peanut butter and chocolate together you can't really go wrong." Truth! chocolate & nut butter is probably my all time favourite combo ever. So good. I've been lazy lately and buying vegan ice cream from the store (they are smart and putting it on sale on really hot days! ), but it's just so easy to make my own, I really should be doing this. 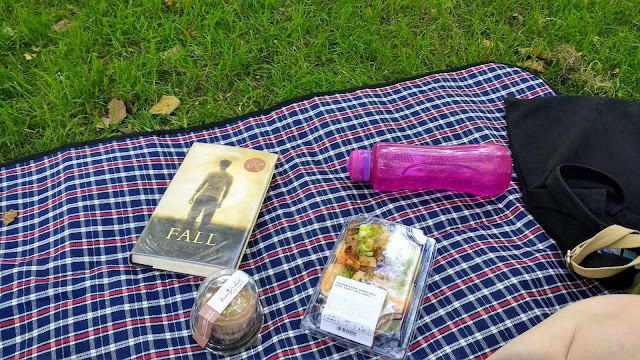 Ah picnic lunch in the park from Whole Foods with a good book. That sounds like a perfect afternoon to me. I would take advantage of ice cream specials too, don't you worry :-) Homemade and store bought both have a place in summertime eating! The PB soft serve sounds delicious! Also love the look of your Thai noodle salad - Thai is a favourite cuisine of mine.